Welcome to the Flying M Ranch! To help us care for this wonderful area, we ask you to follow the ranch rules listed below. The Flying M and its neighboring ranch, the Bar T Bar, work with the non-profit Diablo Trust to help them manage the diverse resources and valuable landscapes of their combined 426,000 acres of state, federal, and private land. If you would like to learn more about the Flying M Ranch and the Diablo Trust, or you would like to leave us a comment about your visit to the ranch, please visit our web page at http://www.diablotrust.org/. Click on the image above to download a georeferenced PDF map of Flying M Ranch. The Landowner Compact agreement with the Flying M Ranch will go into effect May 1st, 2017. The below ranch rules will begin to be enforced on that day. As always, please be respectful of these rules and private property until then. All persons must follow all Ranch Rules as well as all applicable State Laws and Regulations. These rules apply to hunting and recreation on all private lands and State Trust Lands on the Flying M Ranch. Violation of Ranch Rules or applicable State Laws or Regulation may result in immediate cancellation of the Ranch Access Pass, expulsion from the Ranch, and loss of privilege to hunt or recreate on this and all other ranches. Recreational Users must have in their possession a valid Ranch Access Pass and copy of, or ability to demonstrate knowledge of, Ranch Rules. In addition Recreational Users are required to have in their possession either a valid hunting license (and be scouting for or in persuit of legal game) or a valid State Land Department Recreation Permit when recreating on State Trust Lands. 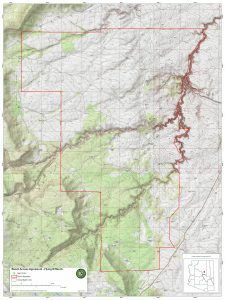 Flying M Ranch Access Passes may be obtained from sign in boxes located at the Forest Service boundary on FS Road 126 (Section 9, Township 18N., Range 11E. )or where the Melbourne Road crosses onto the Flying M Ranch from the Bar T Bar Ranch (Section 22, Township 17N., Range 12E). Arizona State Trust Land Recreational Use Permits may be obtained at: https://land.az.gov/natural-resources/recreational-permits. Do not park, hunt, or camp at or near livestock management facilities such as gates or corrals. Do not camp within 1/4 mile of a water source for livestock and/or wildlife. Keep campsites and other areas clean and remove all your trash. Prevent resource damage by minimizing travel on wet roads and not driving off road when soils are wet. To help Flying M Ranch manage their livestock, and to enhance and protect habitat for wildlife and livestock, please leave gates as you find them. Sign up for access to Flying M Ranch online. The last date you will be accessing the ranch (must be within one year of the "Access From Date"). By submitting this form below you certify that you have read, understand, and agree to abide by all of the Flying M Ranch rules. Violation of any state law, rule, regulation or Ranch Rules will result in suspension of your current Ranch Access Pass as well as suspension of your privilege to access other Ranches within the Landowner Compact. This applies to all private property and Arizona State Trust Land accessed through private property within the Flying M Ranch. You also certify that all of the information you have provided is true, and you are not currently suspended through the Landowner Compact.